Edited by Dfranco_df04, 17 June 2018 - 05:05 AM. Edited by Dfranco_df04, 17 June 2018 - 01:56 PM. Nice to see this thread still going strong. Good job everyone. Edited by Dfranco_df04, 17 June 2018 - 01:55 PM. My best Jagdtiger game. An old 6.7k dmg monster game. I did 62% of my team's damage by myself. Edited by Dfranco_df04, 17 June 2018 - 03:58 PM. Rn got a 2.8k dmg St. Emil mastery with 2 clutch fires on enemies in a row to keep me alive. 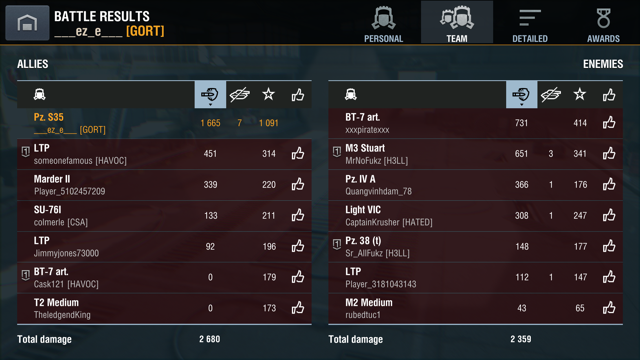 Did 40% of the team damage. Edited by Dfranco_df04, 17 June 2018 - 08:13 PM. Was begging the 35 to help me, but I think he was on Xanax or something. Anyway its a seal clubber but I'm happy with it. Edited by SchnauzerKampfwagenIV, 18 June 2018 - 02:04 AM. And then a 2nd ace in my Tiger (P). It took my 600+ games to ace it, but now I've aced it twice in the last 100ish games. 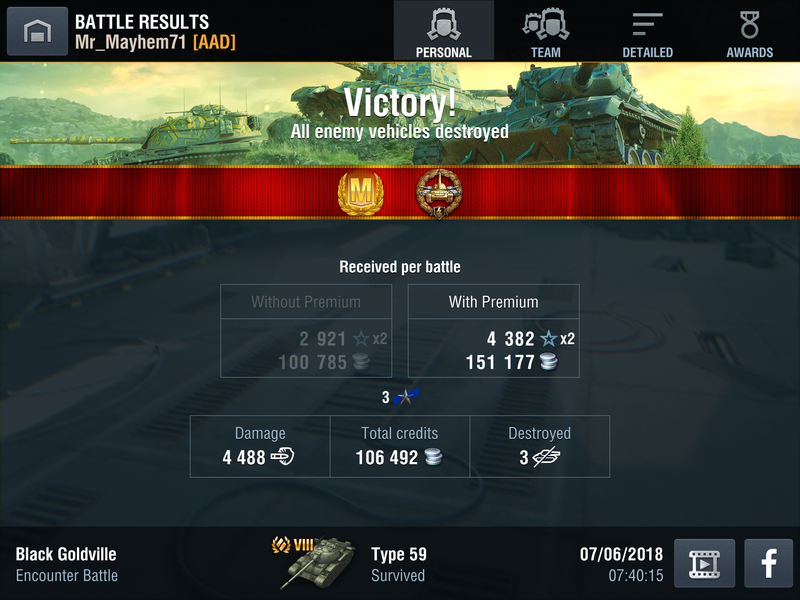 I have now aced very tier 8 tank that I've played. And last night I aced the T34. 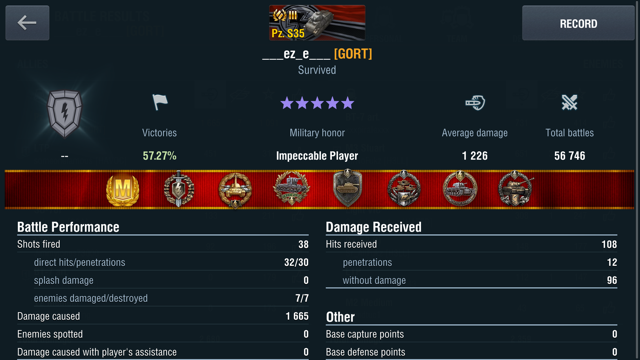 I struggle in the tank with a 44% win rate, but I got an ace after fewer than 40 battles. I'm fairly certain that's the only tier I can say that for (although it's only 5 tanks). Edited by Fu_Manchu_, 21 June 2018 - 08:22 PM. 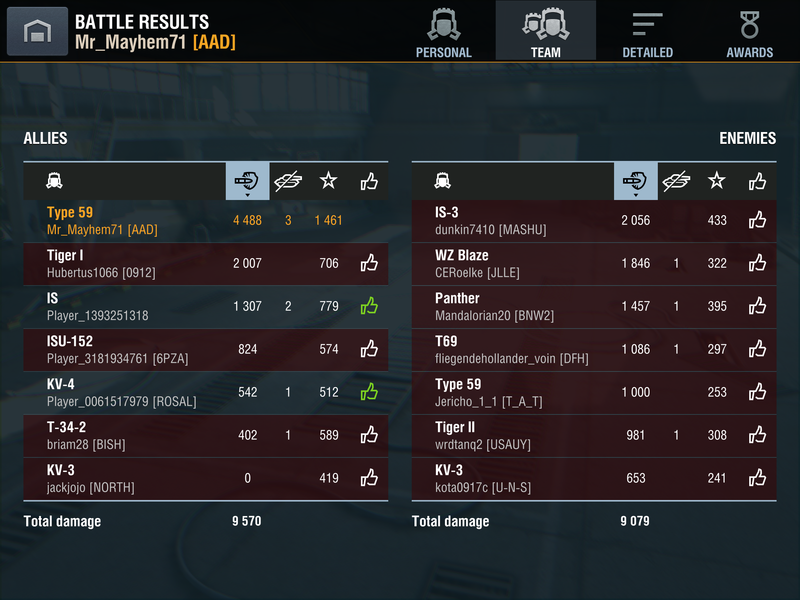 Ace in the T-54 with 7 kills and 6,053 damage. Edited by Destroy0, 26 June 2018 - 04:58 PM. I just aced my shiny new Super Pershing. Picked up another Happy Meal in my Leo. I recently received a Pz S35. That little tank is fun. If me and the Leo had died at any point during this game. and there was even one tank alive on the reds. This team would have had no chance of winning. No one on our team, ever made the slightest move to help us. And never would have. *thanks to Dan_Deerso for teaching me that long ago. Edited by ZebraUp, 01 July 2018 - 11:21 PM. Great game Spart. Especially nice work against the KV-2. I also watched your Bromwell video and I have to say it's nice to see some videos played on PC. I was surprised to see how much you use the autoaim though. I find that too many shots bounce for my liking when using it and I saw that in your Bromwell video when you were shooting the T-150. You bounced a couple of shots that you might have been able to pen without autoaim. The flip side is that you spend far less time in sniper mode than I do, which also has some benefits. Interesting. I tend to lean on auto aim in a couple of different circumstances. 1. A circle of death. 2. When my wife decides it's time to have a conversation mid game. That [edited]is distracting. 3. Long range work on reds. 4. When I want to shoot a red but I also want to look around. Concerning the Bromwell match... I had some weird lag going on and my timing was off. I blame lack of coffee and internet issues. Edited by Mr_Mayhem71, 06 July 2018 - 11:57 AM.